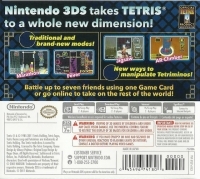 11-17-2012 exonerator Box Text Tetris for Nintendo 3DS will allow fans to experience the game like never before in 3D! With over 20 eye-catching game modes, Tetris for Nintendo 3DS delivers a rich mix of both traditional and innovative ways to enjoy playing the Tetris game. 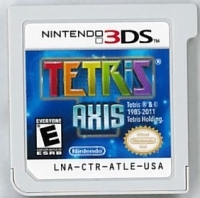 This is a list of VGCollect users who have Tetris: Axis in their Collection. This is a list of VGCollect users who have Tetris: Axis in their Sell List. 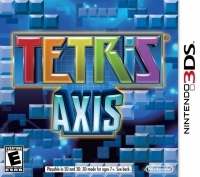 This is a list of VGCollect users who have Tetris: Axis in their Wish List.